You all know the way I feel about blogging. Along with quilting, it has become a must do in my life. 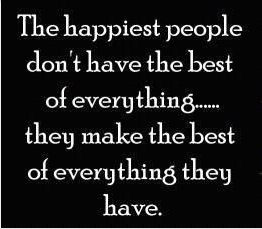 I love to share my ideas and to be inspired by all of you. I have met 2 wonderful new friends who have inspired me with their work. They used the tutorials from my car caddy and the design wall and have created their own works of art. These first few pictures are from Vikki from Sew Useful Designs. You must visit her blog...fantastic. 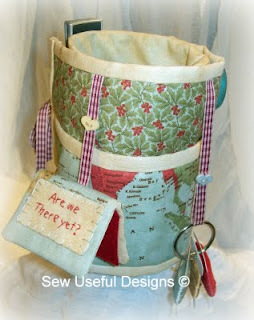 She created this cup holder sewing caddy for her friend (one very lucky friend!!) Is this the cutest thing you've ever seen or what? The little "are we there yet" is a needle holder. The floss holder on the key chain...absolutely clever. and look at the little snips. 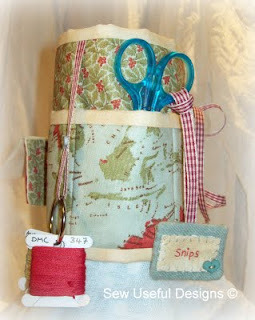 She also sewed her a travel journal. Look closely at the fabric. Peace on Earth by 3 Sisters...to die for how it matches the theme. Vikki, you really should start selling these!!! Thanks, so much for letting me post these pictures. Now onto to Zlaty's fabulous design wall. Zlaty is from Zlaty Sews and her blog is a must see. Pop over and see her tutorial on this wall. Look at how she conquered my fabric nightmare. She sewed four channels for the pipes and look how tight her fabric is...you can probably bounce a quarter off it. Not only do I love the wall, but look what's on it. Zlaty, that is going to be one beautiful quilt. Can't wait to see that finished. This last picture is how Zlaty cut her pvc pipe. Now is that a Tool Time Tuesday or what. That is one serious cutter and I want one!!! Thanks so much Zlaty for letting me share these pictures, I really appreciate it. Karen...thanks for sharing these. 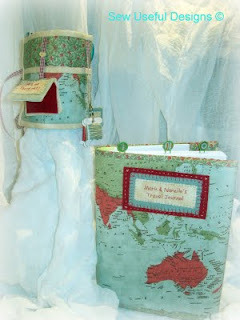 The travel holder and journal are so sweet and design wall is wonderful! See, you inspire so many people! I just love all the creativity that oozes from you blog. You have brought out the best in these two gals...that's for sure!!! You are one inspirational lady, sweetheart! Thank you for all that you share! Wow so much creativity! Thanks for sharing. The sewing caddy is super cute and I like how Vikki personalized it so good! Thank you Karen for the Design wall tutorial and the inspiration! I love my wall and I want a bigger one, too. I am so happy I found your blog and a new friend! I have to go get sewing and maybe work on a bigger wall! Thanks again for the fun ideas. I really want to make the pvc pipe design wall setup. That cup holder, sewing caddy is great! I have been MIA lately but I love the ice cream container pin cushions! you have been so busy! And what a great giveaway, sorry I missed it! Karen, What lovely idea's you have on your blog. When I finally get settle in my new homd home I intend to try some of them. Hi Karen, That cup holder and sewing caddy is adorable. Some people are so (sew) clever! This cup holder is great for holding your coffee mug while you sew in a wheelchair, scooter, on an airplane, or even at a stadium. Works great on nearly any armrest. They're on eBay and Amazon (more expensive on Amazon however), but also through that site I linked, which the wife and I used the coupon code "$5off", but not sure if it's still active. Never hurts to try, just leave off the quotes.